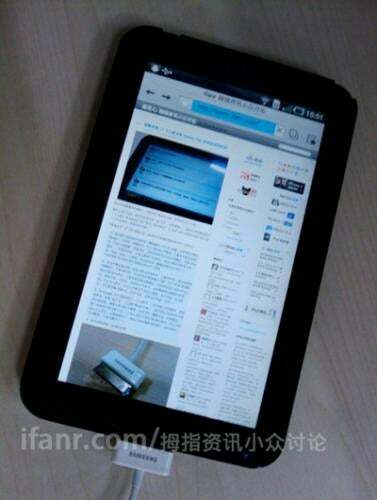 It's beginning to look like the Galaxy Tab from Samsung is indeed sporting a 1024 x 600 AMOLED screen, judging by these latest leaked photos. Accompanying the snaps were some further details on what's definitely the leakiest tablet of all. It's possible to garner from the photos that the tablet is running Android 2.2 (Froyo), and has texting UI Swype. That's no massive surprise, considering Samsung is somewhat of an ambassador of Swype, but it seems a bit unnecessary when there's a full keyboard available as well. Also seen in the photos is that it's charging via a bottom-located proprietary connector, similar to what Apple gadgets use. Onto the other specs, which include a PowerVR SGX 540 graphics processor, GPS, Wi-Fi b/g/n, and as we heard before, a 3.2MP back-facing webcam, and VGA front-facing camera.